I must admit, I’m somewhat giddy that the fall television season is underway—it’s been a smorgasbord of opportunities to bring God-talk into open spaces (Survivor and Jericho being my favorite so far). The new season of one of my long-time favorite series, Smallville, began last night. Comic book stories are good God-talk generators, and Smallville has provided fodder for this blog before—and is doing so again. In this season’s opener, the major cliffhangers of the last one are resolved and we’re moved forward. “Everything’s changing,” reflects Clark at the end of the episode—and indeed he’s right. Paths have been chosen, and the characters are walking them: the young Clark Kent (just freed from the Phantom Zone where someone sacrifices their life to give him freedom to be the hero he needs to be) takes a huge psychological step towards becoming the superhero we know he becomes. And by the longing looks that Lex (just freed from the body-possessing evil Kryptonian Zod, who ironically is a beaming shadow of the person he will become) is giving some broken Kryptonite technology, we know he’s continuing his step-by-step journey towards the villain we know he becomes. One of the things I love about this show is the play between destiny/fate and individual choices. While the events, communities, and environments in Clark and Lex’s lives seem to nudge them down these roads, each has faced (and, if I’m right about this show, will continue to face) crucial decisions where they can change the road they walk. So, while there is some fate at work in events, there are also their own choices as to whether or not they will walk those roads—and that resonates with me as a follower of Jesus. God is always working out his plan (to restore his creation—including us—to the beauty and glory of its original intention) around us, but we have the choice as to whether or not we participate or work against him (is there really any middle ground?). While God longs and works to bring everyone back to him—and into the breathtaking peace, love, grace and glory of his wide-open-spaced Kingdom—we have a choice as to whether or not we’ll accept that offer. Like Clark and Lex, we face decisions all the time (often accentuated by events, communities and environments around us) as to whether or not we’ll continue to walk a path that leads to restoration, hope and love or one that leads to despair, destruction and death. This series illustrates just how hard it can be to choose. The path to restoration, hope and love can be fraught with sacrifice and loss. At one point in last night's episode, Clark faces a choice to save those he loves by swearing allegiance to Zod, who is power, greed, revenge and evil gone amok. Clark chooses to risk the lives of those he loves and continue down the path he’s chosen—one that leads to his role in restoring, redeeming and bringing hope to the world. Lex, on the other hand, believes power will keep him from having to make choices like that and sometimes that illusion is so strong that it makes his road seem the right choice. He has good intentions (he wants to protect himself and those he loves), but he too often chooses wrong (and at times obviously evil) methods. Each time he does so, he’s taking another step down the road he’s chosen—one that ultimately leads to despair, destruction and death for a great many people (including, ironically, those he loves). So it is in our walk with Jesus. Choosing to walk his Way can be difficult. In fact, Jesus tells us his Way will be wrought with sacrifice, suffering and loss—but also that his Father will use all of that and much more to bring about his plan of restoration and redemption and love. Like Clark, we come to realize that the end of the path (and, yes, even the journey itself) is worth it. 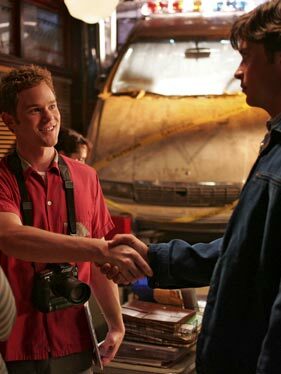 One other scene I must mention is a somewhat minor one that appeared near the end of the episode—when Clark and Jimmy Olsen meet for the first time. I looked over at my husband and commented, “Now that’s a big moment.” The irony, however, is that its significance passed unrecognized for all those involved. We realize its significance because we know the end of the story. For Clark and Jimmy, it’s just another moment—and a minor one at that—in their lives. But great moments like that are happening all the time. Most of us walk through life without realizing it, but if we’re walking in the Kingdom we begin to understand that each moment is a great one. Each moment is a moment Jesus is meeting us and those around us. And those moments are significant because we know the end of the story. We know that God is longing and working for the restoration of all his creation—and each moment plays a key part in the plan. Each moment is sacred. Yes, I’m enjoying this fall season—perhaps, as my husband muses, a little too much. Heh, but then again, maybe not.